Like every other kid who grew up watching cartoons, I’ve always been fascinated with The Jetsons and their technology-driven, futuristic lifestyles. While we don’t have commercial flying cars (yet! ), we still continue to strive toward the high-tech world predicted by movies and television shows long ago. So many devices can now communicate with each other—everything from phones to coffeemakers, cars to streetlights, and wearables to headphones. The Internet has enabled these devices to create their own networks instead of working in silos. This has produced an Internet of Things (IoT), a massive network that merges the relationships between people and people, people and things, and thing and things. This system grows larger and more sophisticated every day. It is estimated that by 2015, 75% of the world’s population will have access to the Internet and will own over six billion devices (Harvard Business Review). In turn, a new industry has been created in which technology supports technology. This was made possible by overcoming past technology barriers. For example, broadband networks can now provide a back-end connection, enabling home networks to distribute that connection to ultimately be managed by remote controls such as smartphone and tablet apps (Forrester Research). These connections open up a world of possibilities for entrepreneurs and businesses. Companies new and old are working to design or redesign their products and services to connect more easily, improving both their function and their consumer appeal. For example, the three following MaRS ventures offer products and services that serve the evolving demands of our connected world. Thalmic Labs has created the Myo armband, a gesture-control wearable device that uses the electrical activity in a user’s muscles to wirelessly control a computer, phone or other digital technologies. By simply waving his or her hand, the user can interact with digital objects and systems, as the Myo contains sensors that detect and translate arm movements into actions. This highly connected device creates a natural and fluid way of connecting with other devices. Instead of turning to smartphone apps, the human arm becomes the remote control. Sensor technology continues to be a growing market in our connected world. Research firm IDTechEX recently estimated that printed flexible sensors will grow to become an $8.7 billion market by 2024. Printed or not, these new sensors are thin, lightweight and typically wireless, which enables them to support the IoT and to become relatively ubiquitous to consumers. Cumulonimbus is an atmosphere data and software intelligence company and one of the five companies selected for the 2013 JOLT cohort. Cumulonimbus’ PressureNet app functions as a network of crowd-sourced weather sensors. Using the barometers built into new Android devices, the app can automatically collect atmospheric pressure measurements and share the live data with researchers and scientists to improve the accuracy of weather forecasting. Another example is MMB Networks, an engineering firm that has expertise in embedded, connected and Smart Energy technologies. 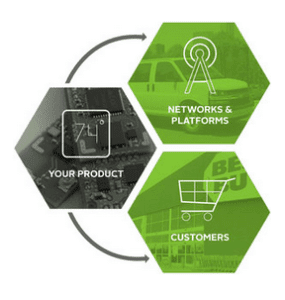 They offer RapidConnect embedded hardware and software solutions, which make it easy to add market-ready ZigBee connectivity to products such as window shades or lightbulbs. MMB helps consumer device manufacturers to quickly enable their products to connect with existing home platforms or perform in tandem with a smartphone app as a standalone product. MMB is unique because their software updates as standards and platforms evolve. For example, MMB can remotely update device software to ensure full compatibility. I sat down with Claudio Munoz, the senior industry analyst at MaRS Market Intelligence, to discuss our connected world and opportunities for entrepreneurs. Sarah Aspler: Why is the connected world so important right now? Claudio Munoz: From a technology perspective, machine-to-machine communication has existed for a while, but now it’s becoming more of a massive consumer technology. We’re now connecting every single device to the Internet. The connected world is important because we have the technology to allow us to do it and that technology is mature enough that you can start seeing new systems being created, like the Apple HomeKit. SA: What challenges are companies facing when working in this space? CM: Privacy is a big one. There’s been a lot of discussion at the university level and in research groups about the standards of connecting devices to the Internet. This discussion hasn’t been concluded and standards don’t really exist yet. There’s a threat in people having access to huge amounts of personal data. The problem is that data can be accessed without clear purposes or permission. Security is also a challenge. There’s the issue at the home level—disarming your home alarm, for example—but it’s more dangerous from the perspective of bigger institutions, such as smart buildings or smart cities. These threats have been here for a while. These discussions are still going on because the technology is constantly evolving. Another challenge is the compatibility between devices. Different companies are trying to implement the wrong solutions to the connected home through the wrong ecosystems. For example, the Apple HomeKit will not work with Android or Windows phones. The house would need to have exclusively Apple devices. It’s a similar situation to that of Internet providers in the United States: they start controlling more and more of your content and give you faster Internet if you are in their own network. This creates silos. If you have multiple systems, they will not necessarily talk to each other. This could be a large problem moving forward, especially in regard to smart cities. SA: What major trends have you seen developing in this sector? CM: Health is interesting because it could result in significant savings. We have a system right now that is maxed out and there’s an opportunity there to find a type of automation that will result in savings, as in other industries that we’ve seen, such as transportation. Transportation is something that has been connected for a while. For example, we’ve had the ability to track packages in the mail for some time. When you have a system like the Canadian healthcare system, there is an opportunity through synergy to find the savings that will allow us to keep going. I also think there will be a big focus on energy. All of this [technology] is great, but you need the energy to power these devices. For example, when a blackout happens we have an enormous system that collapses. What if this happens to your home? The energy sector is so important because it supports the rest of the infrastructure. There are some considerations about not just having smart cities, but about having a connected city that works and is sustainable. SA: What advice would you give to entrepreneurs who are thinking about entering the connected sector? CM: There’s a lot of competition, but there also isn’t a clear winner in the sector. It’s difficult when you start seeing Cisco, IBM, Apple and Google getting involved because then it gets tricky. There are still openings and opportunities, and we do see a spot for entrepreneurs to enter this space by creating front-end products for consumers—for example, hubs like Google’s Nest or home security devices that use phones instead of keys. Finally, energy is an exciting and fairly open sector that hasn’t really been disrupted yet and this could potentially be a big prospect for entrepreneurs. To learn more about the connected world, read MaRS’ Connected World Market Insights Series.